On the occasion of the 47th Congress of International Academy of Ceramics (IAC) 2016 in Barcelona, I’m pleased to introduce this show of Catalan ceramics art in the exhibition’s room of the Llotja school of art. It presents contemporary creations of consolidated names and young values. With these words I would like not to speak about ceramic, but of art, since this show exhibit creations of artists that express themselves in bi or tri-dimension, in sculptural shape, architectural and also pictorial way, employing for their formal and conceptual expression the clay in all variants as terracotta, china, gres, refractory… the enamels and all the material and procedures that take part in this noble fire art, with which the humanity began to manufacture tools and to express from the beginning of the civilization, and that everybody knows as a general name of ceramics. Its recognition as a language of artistic expression seems that is not yet enough consolidated, although our universal artists such as Picasso and Miró have left no doubt of its creative possibilities. Once again we must emphasize that the art lies in what is done, not the medium used. The results do not depend on the material we employed if there is enough craft and skillful, but a successful combination of hands, idea and concept that get to a nonverbal subjective communication between viewers and creators, where the sensitivity of both is the key. 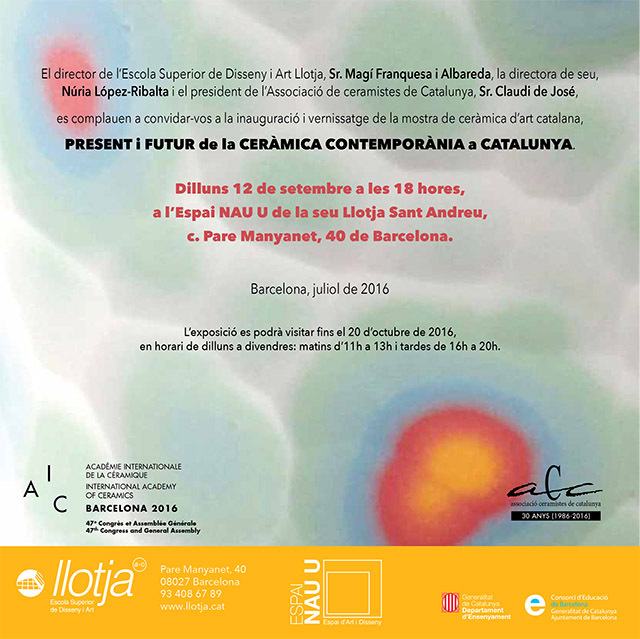 This exhibition of contemporary Catalan artists is certainly a good compilation of diverse results from those using this original and versatile material that is the clay as a way of expression and hope will be a contribution to their improvement, inside of the framework of an educational bicentennial center, spreading and perpetuating the fire arts of the 21st century in continuous evolution and interacting. The International Association of Art Critics, AICA, member.